The gardening season has now ended for me this year. We had freezing temperatures – not just a frost – on October 28th into the 29th. It got down to about 27 to 28 degrees. 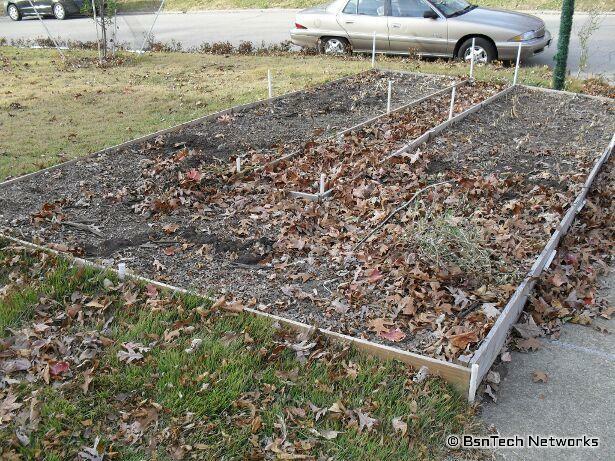 We had a very light frost a few nights ago – on October 22nd – but it didn’t damage any plants. 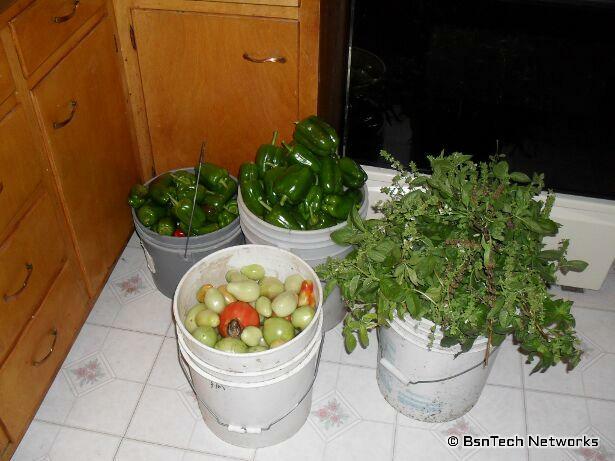 Because of the freezing, the rest of everything needed to be pulled from the garden. I started with the peppers. Out of the eight California Wonder pepper plants, I didn’t expect to have very many peppers. 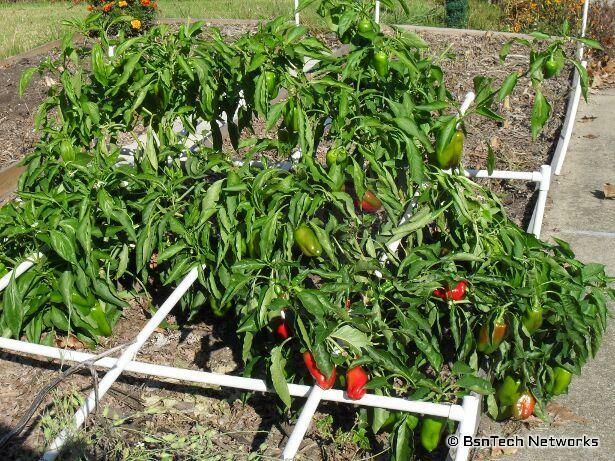 Throughout the season, the peppers seemed to almost be dormant; they did not grow nearly as well as they did last year and the production was down. However, I went out with about a three-gallon bucket. 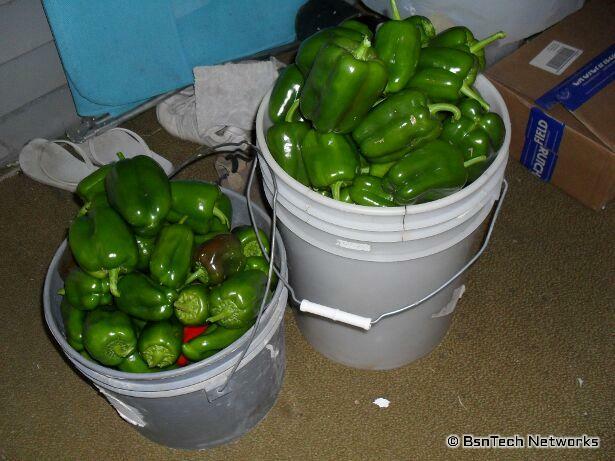 I quickly filled the three gallon bucket with peppers just from the first two plants! 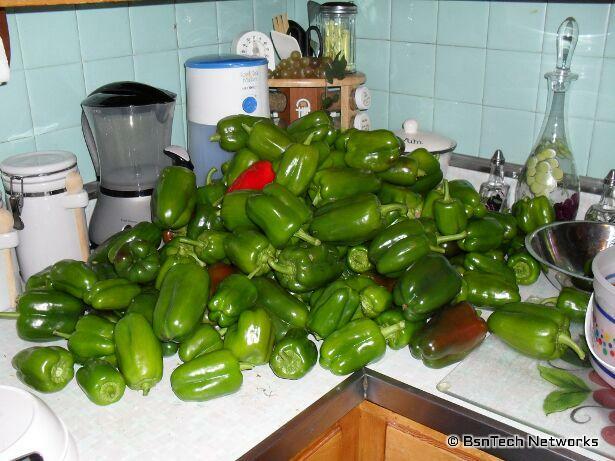 When it was all done, I ended up having over eight gallons of peppers! Apparently when the weather turned cooler in September from the very hot temperatures this year, the peppers put on dozens of blooms everywhere. Maybe adding epsom salt around pepper plants also made a difference. Now, look at them across the counter. Wow! It looks like a supermarket. So how many peppers are there? Well, there was a total of 146 of them. A total of over 26 pounds of peppers! If we were to go to the local grocery store and buy these (at a current price of $2.99 a pound), that is over $77 worth of peppers! Unfortunately, we certainly cannot use this many. I gave a good bucket of these to the neighbor – and am thinking that I may give at least another half or 75% of them away to the Good Samaritan Inn – which is a local day center in our community that provides food for the homeless. Next, I had to tackle the tomatoes. I knew that I was going to be quite upset about what I was going to get from the tomatoes. 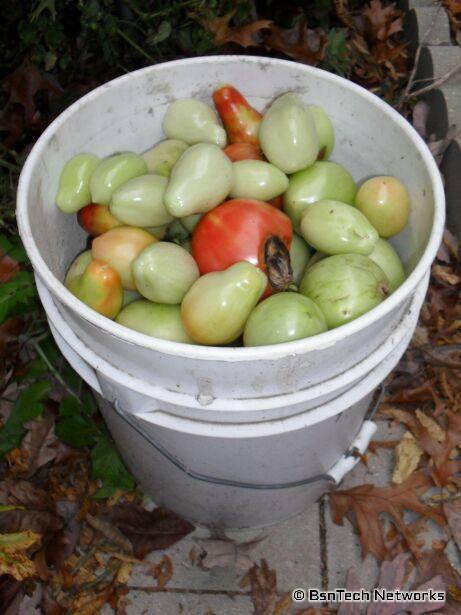 Sure enough, a full five-gallon bucket of tomatoes were picked. 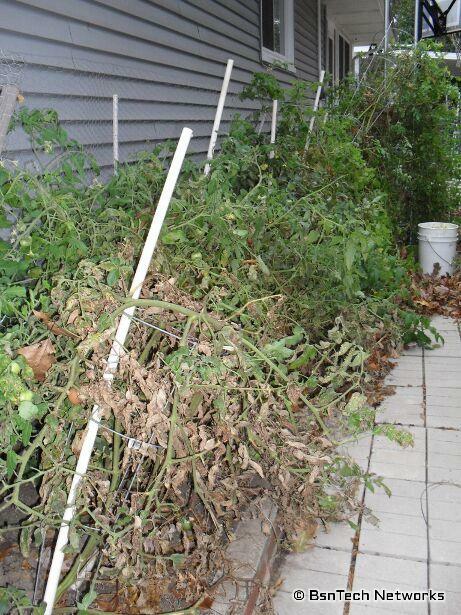 Something damaged the tomato plants quite extensively. Last year I didn’t have that problem – although a fungus took them over. This year, I think there was a lot of stink bug damage and something else that causes black spots on the tomatoes (not just on the bottom or top – so not blossom end rot). Usually if we picked them just as they were turning pink, they would ripen inside and we could use them. Otherwise if they ripened on the vine, they went bad. 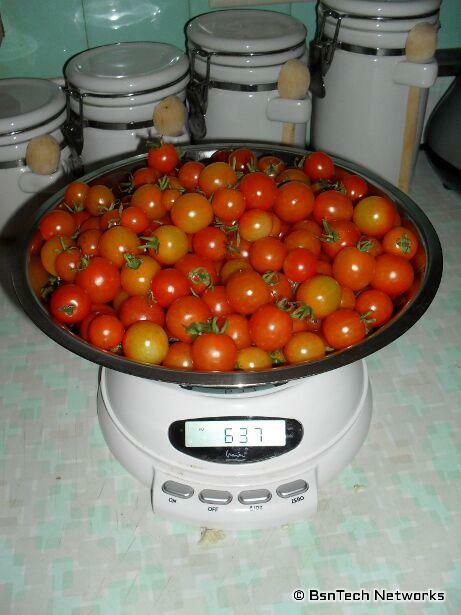 So out of the year-end green tomatoes that were picked, it amounted to 19 Roma tomatoes and 82 Best Boy tomatoes. A total of over 22 pounds. Earlier in the day, the wife spent some time and picked the red cherry tomatoes. There was over three pounds of these and I shared half with the neighbor since we won’t eat this many. It seems that once the end of the season gets near, we don’t eat nearly as many fresh veggies from the garden. And lastly, the basil had to be picked. 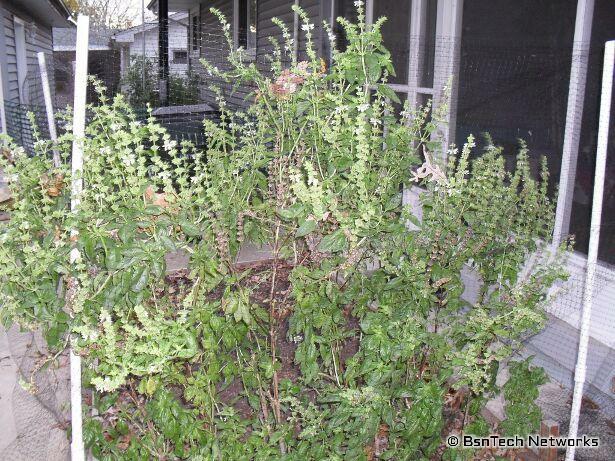 First off, here is a picture of the oregano at the end of the year. 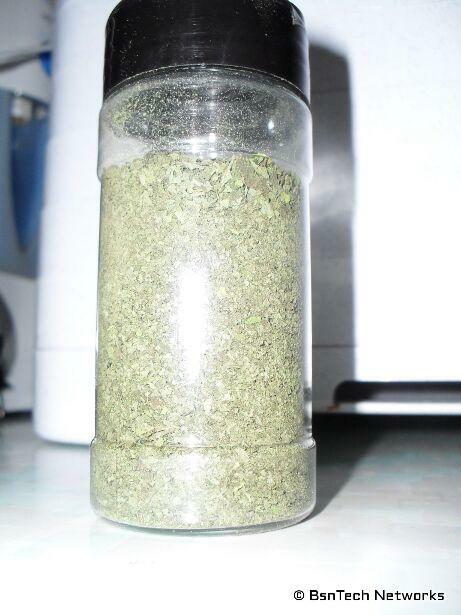 We didn’t get any oregano this year; just was too small. Apparently it also needs a good year to get itself started. I did see that there are a few runnings from the main plant that are rooting and starting a new plant, so hopefully we’ll have a good amount of oregano next year. A lot of the leaves were just too small to use. 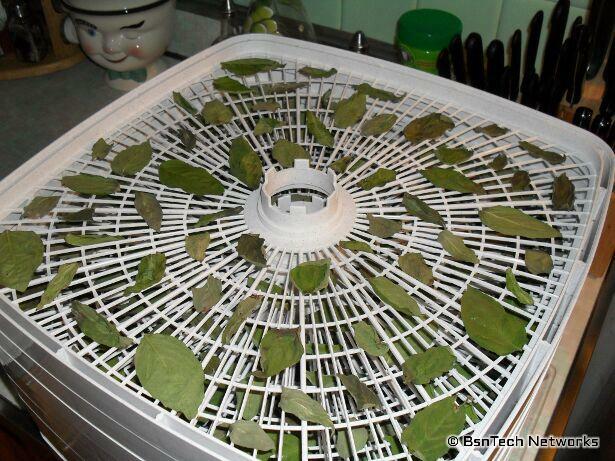 I am thinking next year I am going to attempt dehydrating full stems of leaves. 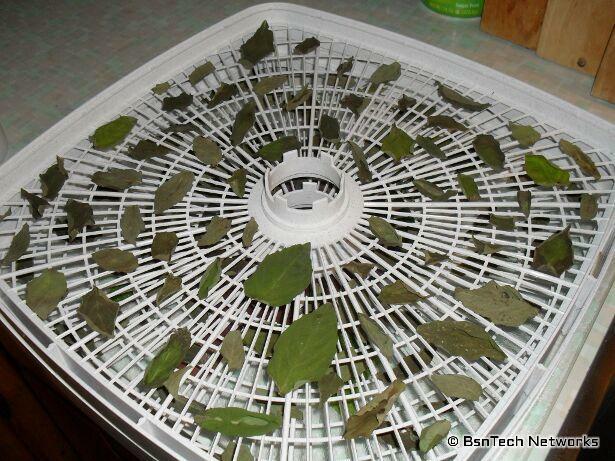 Plucking each individual leaf and then setting them on the dehydrating trays takes a good hour or more each time. I cut down all of the plants and from all of those plants (about 15 total) at the end of the season, I kept about 6 1/8 ounces of basil and dehydrated it (which just completed just 15 minutes ago). Today was cleanup day. 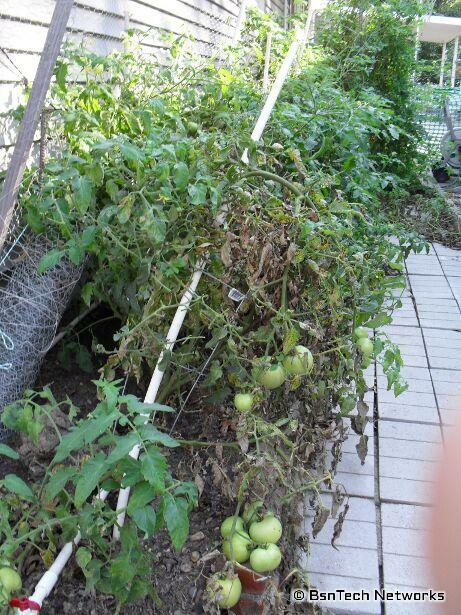 The plants were looking very bad after they were frozen on the night of the 28th. All of the fences and netting have been taken down, the rebar and posts taken out of the ground, and the plants all pulled up and thrown on the compost pile. Over the past week, I have been mulching up leaves in bulk fashion. The neighbor has two large trash containers so I completely filled both of those. 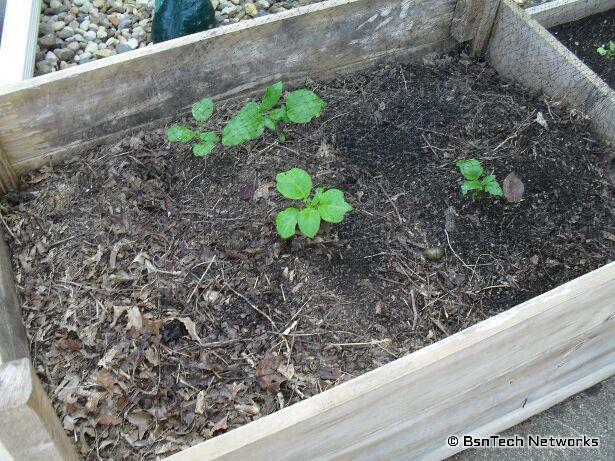 I even had to get in the containers and stamp down to compact the leaves to fit more in there. I also filled three large trash containers of mine with leaves as well. I’ll eventually get as many of these leaves spread over the garden and get them tilled in; hopefully before winter hits. That will help to add a lot of organic matter and fertilizer into the ground. 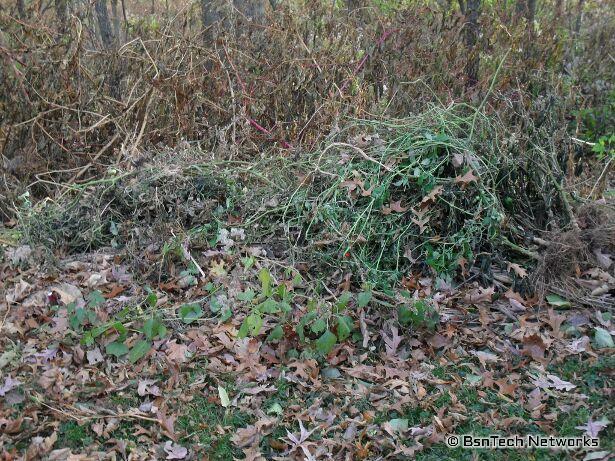 Anyways, enjoy the pictures below of the year-end garden cleanup. 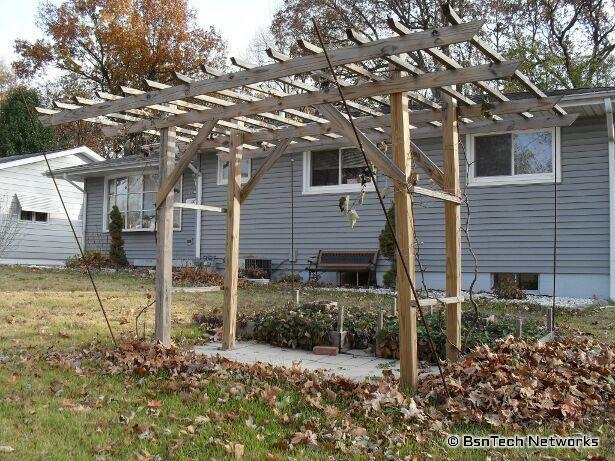 Below is the grape arbor / grape trellis. The grapes vines have fully went into hibernation. And the strawberry pyramids. They have been covered to keep the deer from eating them and the stray cats from using them as a litter box. 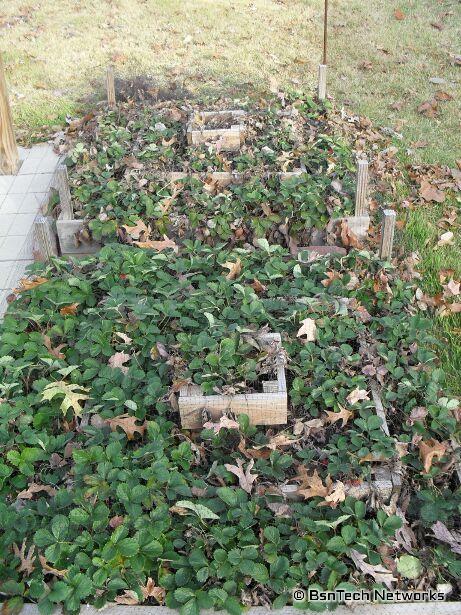 The far strawberry pyramid doesn’t seem to be doing nearly as well as the other; I need to backfill these with compost as well. The garden behind the garage with everything removed. Garden next to the house where the tomatoes were. The patio garden where the herbs were grown. 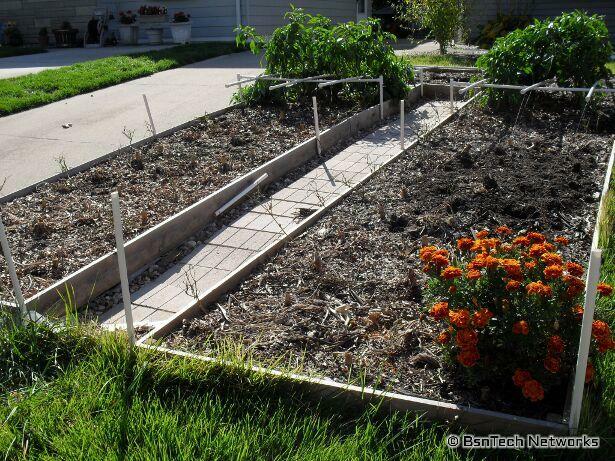 The carrot bed. One carrot is still hanging in there along with the radishes that were planted over a month ago that never did anything. I’m sure the deer will take care of these tonight now that they are uncovered from the deer netting. 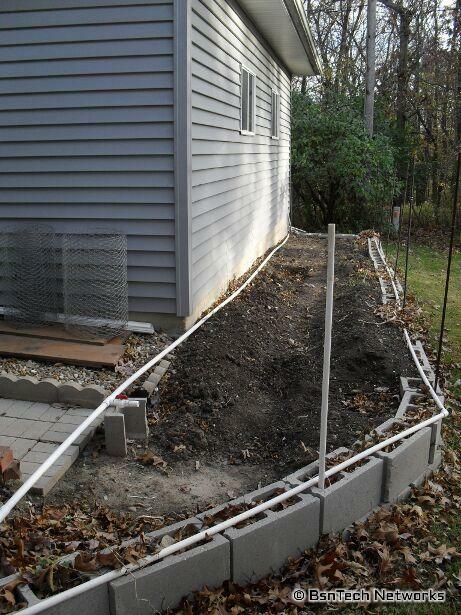 And the front garden with all of the PVC pipe removed for irrigating the garden. 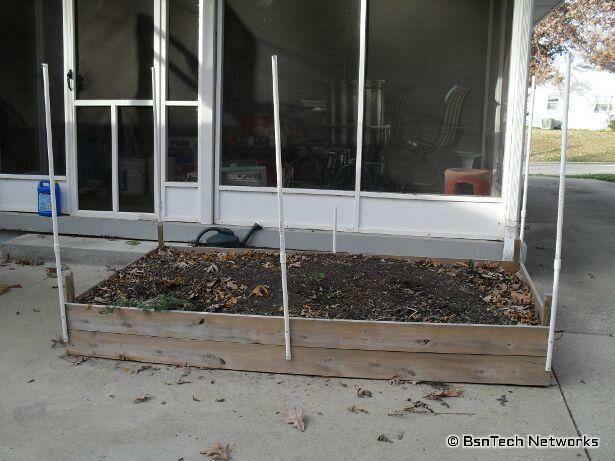 No more peppers and the large marigold plant that took up home has also been pulled. 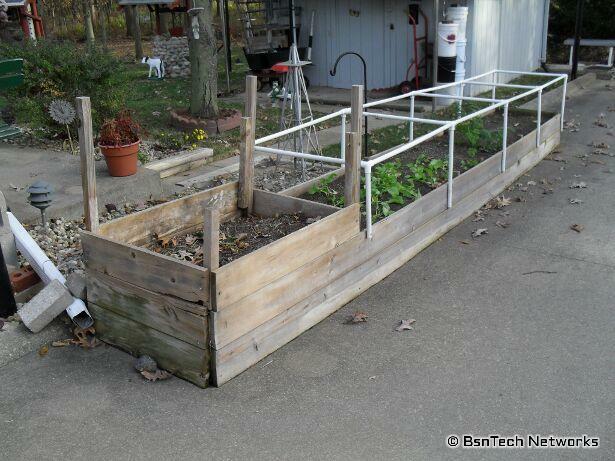 The one large radish plant still exists in the front – which is where I harvest the radish seed from. Maybe I’ll get some more seed soon. 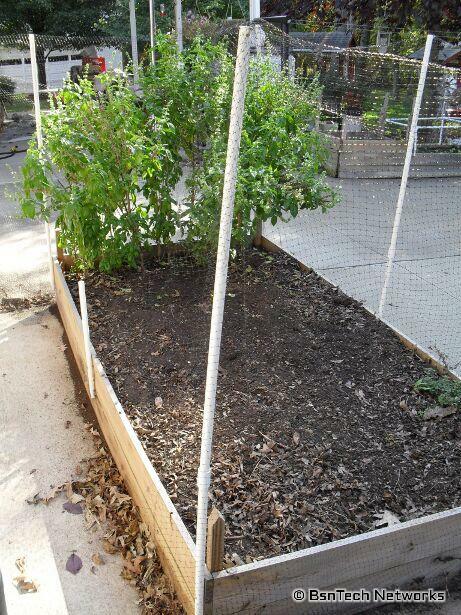 And lastly, the big compost pile with the pepper and tomato plants added. I’ll now need to go through my journal – and also make an electronic copy of it here on my blog (like I did last year). I need to tally up the totals from all of the produce this year and see how it compares to last year. Then comes the planning for next year’s garden! Nothing going on this week around the garden. I haven’t picked anything from the garden this week. It has been in the high 60’s, low 70’s this week and it is beginning to slowly get cooler. 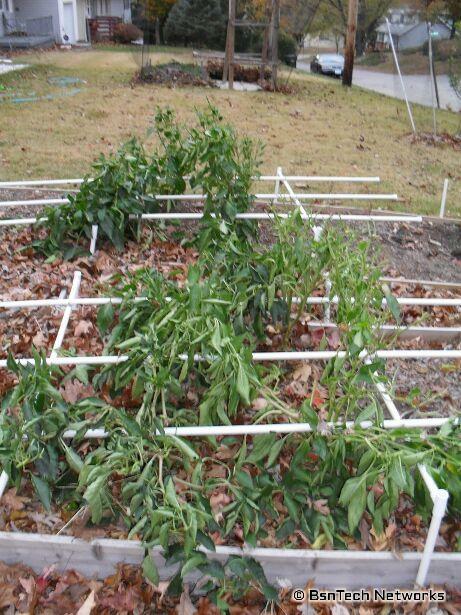 Luckily we have not had our first frost yet so the tomatoes and peppers are still on the plants. 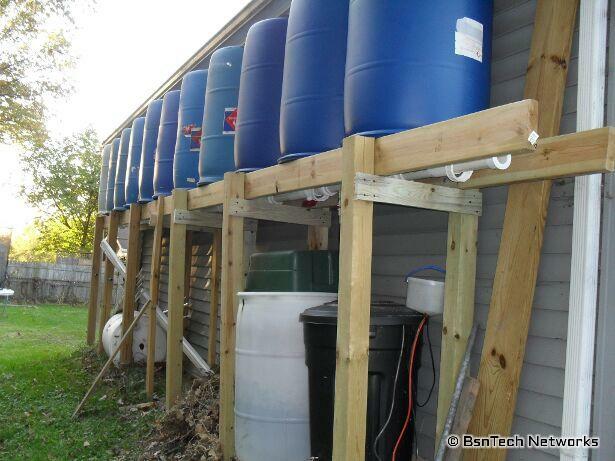 However, this post is just about the rain barrel system (again). A recycling place here in town has the blue 55 gallon barrels for sale for $10. Over the past few weeks, I have purchased three barrels – which is the maximum capacity for the entire rain collection system. Our garage is 24 feet square – and the barrels are just under two feet wide. Therefore, a total of 12 barrels with a maximum capacity of 660 gallons of water can be held. Nine barrels have been used all summer – so now I’ve added the final three. Above is a side view of the system. There is still one at the very end (on the right side) that I have not put up yet. This is because the downspout prevents me from putting the last barrel in place because of an elbow at the top. After I take this out, then I can put the last one in. You can also see some 1×4 pieces of wood that are holding the posts together. Over the year, I did notice that the posts seemed to be moving apart from one another. Several people on YouTube also commented and told me I needed to tie the posts together. So, this should help strengthen things up for now. In the photo above, you can see a front view of the barrels. The one on the ground very close in the picture is the last one that will go on the end on the right-side. You can see the elbow downspout on the right side which is preventing me from putting the last one in place. Another thing I had to do today was to re-level the horizontal wood supports. Over time, it seems that the posts near the garage wall settled and went down about 1 – 2 inches. So I had to take down that 2×6 board that was next to the garage wall. I then put the 1×4 supports in that tied the posts together – then re-drilled and put the 2×6 board back in place. Now it is level across the top once again. Hopefully the settling is all finished because I don’t know how many more holes I can drill! This is my fault though – because I should have used concrete. But, it was taking a lot of concrete to fill the holes – so I only filled the first three or four holes when I first started the system last year about this same time. And lastly – I have some new items that I added on! Yes, I very HUGE 2″ ball valve was added. Why did I do this? Well, in case I want to add compost tea directly into the mix, I will now have three barrels to the right of the ball valve (and nine to the left of the ball valve). This will allow me to open/close the flow of compost tea if I use it for this use. It is also nice as well because if I have a leak somewhere in the three new barrels, I can just shut off the flow and fix the leak. Sure, I will still lose three barrels of water, but that is better than all 12! 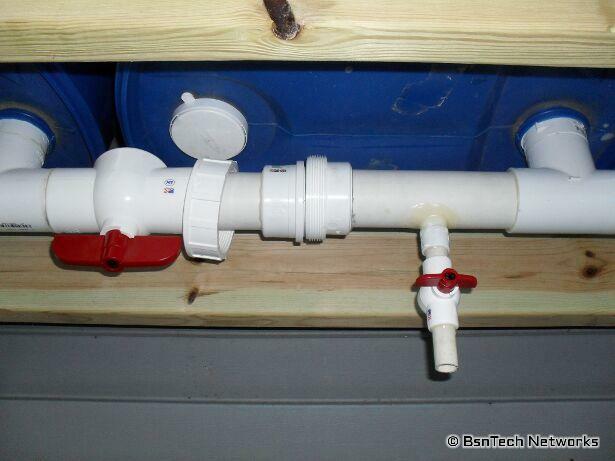 Then, you will see a small 1/2″ ball valve pointing down. What’s this you might ask? Well, notice that it is to the right of the ball valve. So, that means that I can use this pipe directly to tap into the compost tea. If I want to fill my watering can or a sprayer with compost tea, I can do so right there! Right beneath the spigot is another 55 gallon drum that is filled with dead plant materials. I can also use the ball valve to dump water directly into the barrel with all this dead plant material to make compost tea! I had to cut a 1″ hole in the 2″ PVC pipe to connect the ball valve. I am REALLY hoping that this doesn’t leak! I got lucky and I did the same thing on an elbow. I drilled a 1″ hold in a 90-degree 2″ elbow and then put a 3/4″ threaded PVC pipe into it – which then leads to the actual pipe to get the water from the system. I had to use a lot of PVC cement to ensure this was fully leak-proof – and it worked. So, I’m hoping that I can get lucky a second time around by basically doing the same thing – except this time it is in a straight piece of 2″ PVC pipe. If it leaks, then I’ll have a mess on my hands with trying to fix it up. 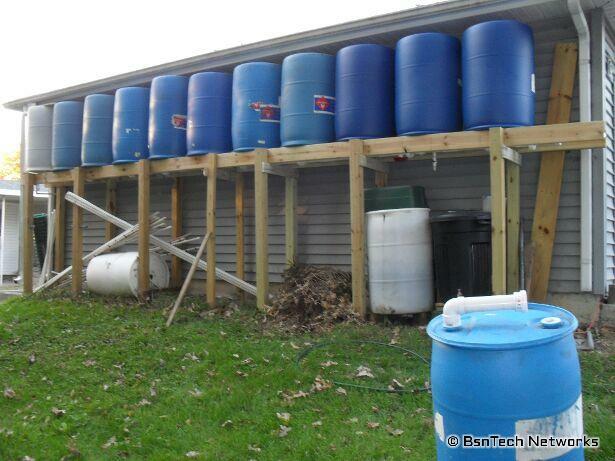 So, the rain barrel system has been fully completed. When I first started out, I surely thought four barrels was going to be enough. Then I added two more to make six. Then I added three more to make nine. Even with nine, I still had about a week period of time where I ran out of water! So by adding these last three barrels, this should give me enough water for those extended periods without water – and the three barrels can be dual-purpose – either for water or compost tea! I got a great deal on this dehydrator at the beginning of the year by purchasing one of the used versions that was fulfilled by Amazon (so I still got free shipping). We use the dehydrator for one purpose mostly – and that is dehydrating fresh basil leaves. The dehydrator came with four trays. When I filled the four trays with basil leaves and set it on the recommended setting of 95 degrees (lowest setting), it would take the basil between four and five days to full dehydrate. Yes, four or five days! Later we decided to go ahead and purchase four more trays to max the unit out – so we could pick more basil (about five ounces worth at a time) and fill the eight trays. Now it takes between seven and eight days to full dehydrate the basil! This seems like an extreme amount of time for dehydrating basil. Even in the book that came with the unit, it indicated basil should be dry within 24 hours. Definitely not the case. We then tried a few trays of strawberries from the garden. The book said (if I recall correctly) that it should take 11 – 12 hours to dehydrate the strawberries. Nope. It took about two days. The dehydrator is very reliable and the fact that it has square trays was the sole reason I purchased the unit – for the fact that you can fit more on it. I plan to do some experimenting with the dehydrator here soon with the last batches of basil before the frost hits. I believe that the slow drying times is because of the 95-degree recommended setting for herbs – but I plan to try to do my next batch of basil at the highest temperate setting and see how long it takes then – and if there is any difference in the quality of the basil once done. You can read about this on bsntech.com when completed. Let’s start with some information about this dehydrator. Above is a top photo of the dehydrator. 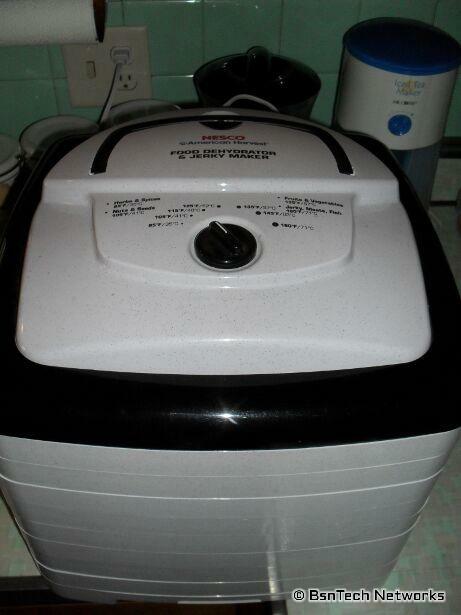 The Nesco / American Harvest FD-80 dehydrator has the blower and heater on the top. Other models may have the blower/heater in the back, one of the sides, or the bottom. I opted to purchase this version with it on the top – because in case of any water leakage, you don’t want it leaking down into your blower/heater if it is at the bottom. You can see the temperature setting on there as well with some of the recommended temperatures for various items. This comes in handy because you don’t need to resort to the manual every time to look things up; it is right on the top and easy to read. Another big reason I purchased this dehydrator was because of the square-shaped layout. Why? Well, how much surface area does a circle have compared to a square of the same size? Less. So that means you get more bang for your buck with the square model and you have more usable square feet available. Noise – Well, there is some noise to it – but that is a given. It isn’t terribly loud but we can hear it throughout the house. Our kitchen is centrally located in the house between the other rooms (about 1,100 square feet) – so we can hear it running if there isn’t any other noise. The noise isn’t bad at all and is quite tolerable. It is about the same noise level as running a ceiling fan on high. Construction and durability – The entire thing is made of plastic. it has that nice “cookies-n-cream” look to it with a white plastic with little black dots embedded in it. The outside perimeter of the trays are built well – but I do question the actual area of the trays where you lay the items to be dehydrated. I’m always afraid that if I push too hard, that it will snap some of the plastic. Speaking of the trays – some folks have complained about items falling through the slots in the trays which allow for the air to penetrate through the trays. While I have had this happen a few times where basil falls through, it is tolerable and not bad. Expandability – The American Harvest FD-80 came equipped with four drying trays. They all just stack on top of one another. It is expandable up to eight trays (which I later purchased to max the unit out). In the picture above, all eight trays are shown. Now, let’s get on to my experiment with the temperature settings and various drying times. The very first batch of basil that I dried – I washed the leaves. This can be seen in the below picture with the sheen coming off of the leaves. I did not do this on all other batches after this. Washing the leaves added the additional moisture to them and it took a bit longer to dehydrate them. Looking back at these leaves, I am astounded to see just how big those leaves were! In the batches since, the leaves have been smaller. There is a lot of space between the leaves – as you can see above – but with all batches after this, they were snugged in very close together. Of course, the more you load your dehydrator and the less space between the items, the longer it will take to dehydrate. One day later, this is what the batch above looked like. The basil has shrunk quite a bit because of the moisture escaping the leaves, but the basil still was not fully dehydrated – which is obvious when you look at the bottom left-hand corner leaf that still is very green. Our dehydrator is not used nearly as much as what other folks use theirs for. Ours has only been used to dehydrate basil and some cilantro. However, just as my review of the Nesco FD-80 dehydrator that I wrote on Amazon, ours takes a LONG time to dehydrate herbs. The booklet that came with the dehydrator says it should only take 24 hours to dehydrate basil and herbs. Not so. I e-mailed Nesco Customer Service and got a nice response back from Joy. Joy indicated that our unit is potentially defective and for me to call into Customer Service to setup an RA (Return Authorization) number. I would be required to pay shipping to them – but they pay to ship it back. This is all provided that my unit is still under it’s year warranty – which it is. Now the question is – is it really defective? I posed a question to Joy and asked her if the booklet that indicates basil should dry in 24 hours is based upon the highest temperature setting on the Nesco FD-80 dehydrator – which is 160 degrees. The lowest setting – which they recommend for use on herbs (as seen in the picture above where it says “Herbs & Spices”) – is 95 degrees. As in my review of the American Harvest FD-80 dehydrator states above, it would take three to four days to fully dehydrate basil at 95 degrees with the included four trays. Bump the trays up to the maximum of eight (like we did after the first batch of basil) and it takes seven to eight days. I have some basil dehydrating at this time. I put it in there and fired the dehydrator up at about 2:30 pm on Sunday. This time, I decided to experiment – and I have the temperature setting at 115 degrees instead of 95 degrees. It is now Tuesday. About 41.5 hours later, some of the basil on the top tray already appears to be dehydrated! So the question is – again which I asked Nesco Customer Service – does the temperature make a difference? To me this was a common sense question. If you have room temperature air blowing on you, how long is it going to take you to sweat? Now, how long would it take 160-degree heat blowing on you to make you sweat? I hear your thoughts – exactly. While I haven’t fully proven this yet, it does appear odd that 41.5 hours later (still well over the 24 hours the book says it takes to dehydrate basil), some is already dehydrated. Last night when I checked, the leaves were withered up but they were still “limp” and had moisture. This morning when I picked up a few pieces, they were indeed fully dry and maintained their shape when they were picked up. Stay tuned with this experiment. I’ll also compare the basil that I’ve dehydrated at 95 degrees to this that I’ve dehydrated at 115 degrees and see if I can tell any difference. The next experiment I’ll try is to run the dehydrator at the highest setting of 160 degrees and see how much closer I get to dehydrating basil in the amount of time the book says that came with the Nesco FD-80 dehydrator. Well, the basil is fully dehydrated! This batch started on Sunday at approximately 2:30 pm. It is now Thursday at 4:30 pm and I’ve removed and crushed all of the basil. Can you tell much of a difference between the very top tray and the very bottom tray? To me, it almost seems that the top tray is drying faster than the bottom tray. You can see that the curling and browning of the basil on the top-most tray seems to be more present than the bottom tray. After taking these pictures, I did rotate the trays. So the bottom tray became the top, the second-from-the-bottom tray became the second-from-the-top, and so on. Now moving to the results. At a temperature setting of 115 degrees to dehydrate basil, all eight trays completed in HALF the time it takes if the temperature setting is at 95 degrees – which is the recommended setting from Nesco/American Harvest. Hard to believe that just 20 degrees differences cuts the time in half! So, it took a total of 98 hours to dehydrate the basil at 115 degrees. Now, what about quality? Is there much of a difference between dehydrating basil at 95 degrees or 115 degrees? For the most part – I couldn’t tell. Taste was the same and the aroma was the same. However, I did find that crushing the basil that was dehydrated at 115 degrees was easier – and it crushed into much smaller pieces. Continue to stay tuned to this post. I will update it with the next batch. The next batch of basil will be dehydrated at the highest setting – 160 degrees. The next batch of basil has been started at about 11:30 AM. The temperature is set at 160 degrees; the highest setting. We’ll see how long it takes to dry this batch at the highest setting. As an update, I changed the temperature from 160 degrees down to 135 degrees (20 degrees higher than the last trial – which was 115 degrees) after about two hours. Why? Well, the basil was getting cooked and started smelling – as my wife said – like candied yams! Very sweet smell but it was cooking the basil. This batch probably is ruined. So, I DO NOT recommend drying basil at 160 degrees. After another two hours, I changed the temperature up to 145 degrees. It does appear that some of the basil is almost fully dried already. Amazing considering it has only been about four hours so far! So again like my previous hypothesis, the temperature definitely makes a difference in the time required to dry anything. I may have one more batch of basil that I can take from the garden – as long as the frost holds out. I will then try an additional test at 135 degrees. Because I cooked the basil in this period, the taste tests will be way off I fear to make this trial worth considering for dehydrating herbs. Dehydrating is already done! Approximately 22.5 hours on this round! That is four times faster than when the dehydrator was set at 115 degrees and eight times faster than drying at 95 degrees. However, I still need to redo one more batch since the setting was put on 160 degrees for a few hours and potentially changed the flavor of the basil. The last of the basil has been taken from the garden due to a hard freeze that occurred. After closely packing 6.25 ounces of basil on eight drying racks, I set the temperature at 125 degrees at 10 pm. The basil was – for the most part – dehydrated by October 30th at about 4:30 pm. That means it took 42.5 hours to dehydrate at 125 degrees. Compare that to 98 hours at 115 degrees. So by increasing the temperature by 10 degrees, it dropped the time by more than half – by 55.5 hours. However, the basil could have been dried longer and I bet to get 100% drying of the leaves, it would have taken another day. The trays would have also needed to be moved around. The very bottom tray – only about half of the basil was fully dry – which made it pretty hard to crumble up with the undried leaves. The second to bottom tray and third-from-the-bottom trays (sixth and seventh from the top) were mostly dry but a few leaves didn’t get completed either. So taking this into consideration, it does show that you need to move the trays to get even drying. If I were to have moved the trays, I’m sure it would have at least taken another 12 hours to fully dry those leaves. Therefore, by upping the temperature from 115 degrees to 125 degrees, it didn’t cut the time fully in half, but still did produce quicker results. The basil was not cooked and had nice green coloration to it at this temperature. 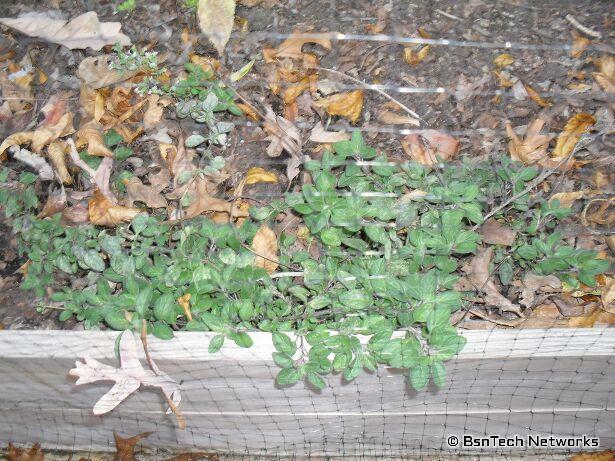 OK – it is 10-10-10 day (October 10, 2010) – but that doesn’t necessarily mean it is garden cleanup day. But it was around my garden. The Straight Eight cucumber plants all succumbed to powdery mildew. 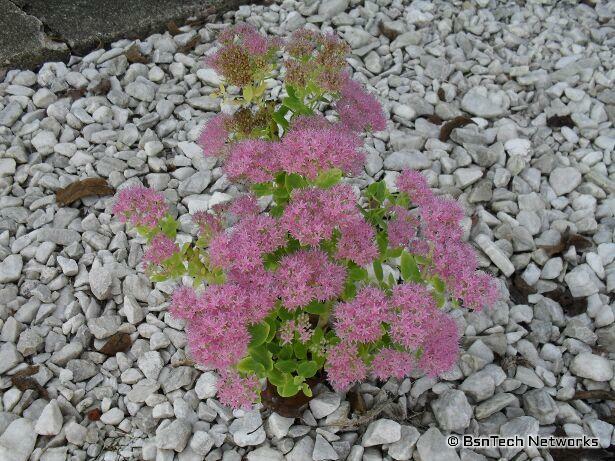 Ever notice that when you are around a plant that has powdery mildew all over it – that there is an off-smell? Wow – to me that is kind of scary – thinking all of those mildew spores are in the air surrounding the plant as the plants are pulled down and put on the compost pile. 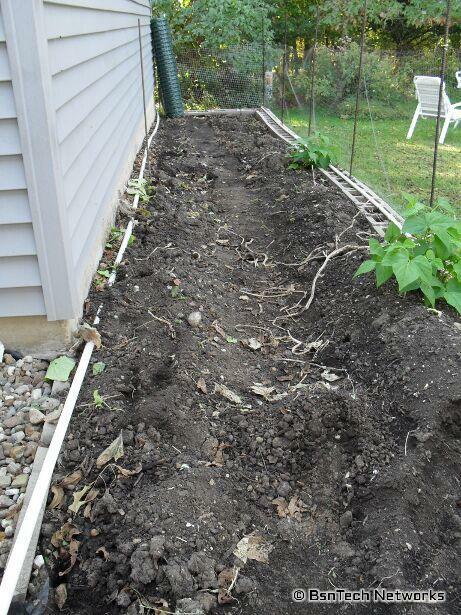 After the cucumber plants were all removed, I took the green snow fence down. I’m going to remember to NOT use this snow fencing for support next year. The peas simply did not like it because their tendrils could not grasp around the large pieces of plastic. The cucumbers did fine, however. Looks quite a bit different now. The boards that were put down on the ground as a walk-way have also been removed. There are still a few Greencrop green bean plants that came up as volunteers that are doing well. 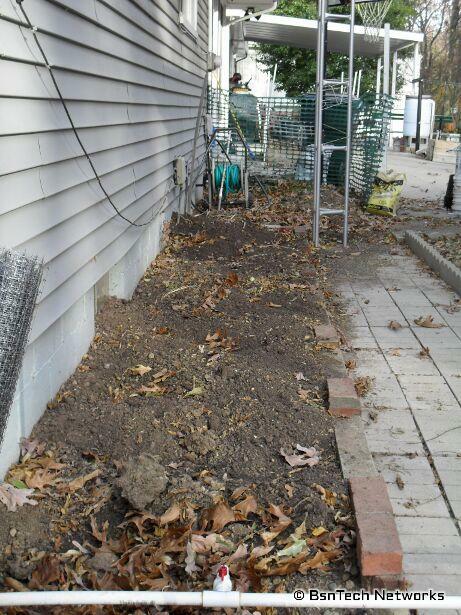 All of the PVC watering pipe has been removed as well – except for the 3/4-inch pipe (on the left side) that is the main pipe leading from the rain barrels. 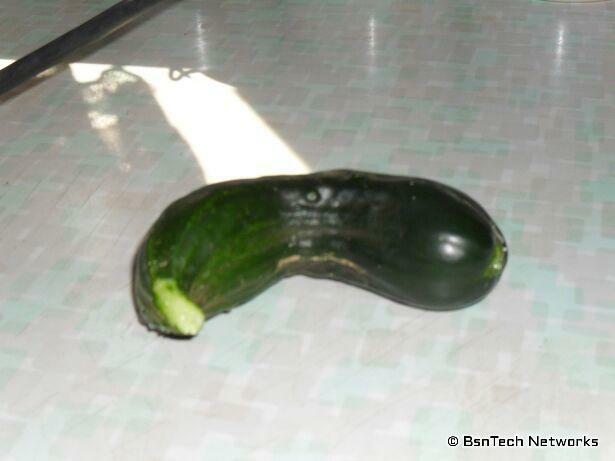 I did manage to get one more cucumber from one of the plants before pulling them down. It doesn’t look nearly ripened up – so we’ll see how it tastes. Just a 90-degree turn from where I took the picture of the back garden – is the garden by the house with the tomatoes. We’ve been spared lately from a heavy frost. Last week we had two nights where it got around 34 degrees; very close to freezing. Now the past two days it has been back into the middle 80’s and this week will be in the high 60’s to low 70’s. The tomatoes are still alive and doing well. Look at all the green tomatoes! Unfortunately because of the cool down, none have ripened up in the past week (or more). We are still getting some cherry tomatoes, however. I just hope that once all of these green tomatoes are harvested – that they will ripen up in the house so we can use them for something. The patio garden still looks the same. The basil is still growing well. i’m not too sure what to do with all of this basil actually – I already have three large herb containers filled with it. Someone mentioned making pesto – which would be fine – but I just question when we would actually use it. Some buddies have popped up in the potato bin – more potatoes! These potatoes have been growing for a few weeks now; I just don’t have the heart to pull them out. There were quite a few very small potatoes that were in the bin when I harvested it; not nearly large enough to use for anything. So now they are sprouting. Right next to the bin is my radish experiment. These plants are doing well from the seed I saved from the radish plant in the front garden. 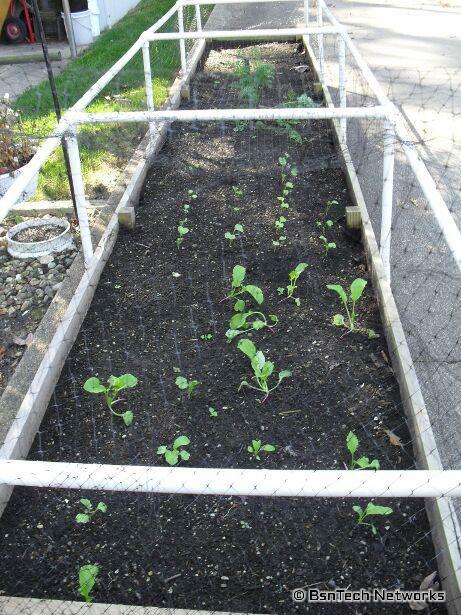 The first batch had 17 of 24 radishes sprout – and the second batch had 18 of 24 sprout. So that is about 73% germination of the saved seed. Not too bad. There is also the lone carrot still growing very well in the back of the photo. Moving to the front yard and taking a break for a moment from the garden. The wife cut several small pieces of setum and planted them in the front landscaping. One of them has pink flowers on the top. Another setum that was the mother plant had larger flowers, but the flowers are more a very dark red/maroon color. Alright – now that we’re in the front yard, here is the full front garden. Not much left in the garden except the peppers. All of the green beans have been eaten down to the stalk by the deer. There is also that HUGE marigold plant at the side of the bottom right of the photo. Yes, that is only one marigold plant. I’m not sure how it got into the flower bed – but it made it’s way there. And now for the peppers. I need to get some of these plucked off of the plants before long – but I am waiting for them to turn fully red. There was something getting to these peppers earlier in the year where there was a big spot on the peppers that was squishy and a creamish-brown color. It happened on all of the peppers just before they began turning red. But now, they do not have that problem – because it is cooler maybe? But you can see just how many peppers there are on the plants. I bet there is more on the plants right now than what we’ve harvested all year. With the weather getting cooler from those 90+ degree days (had over 24 of them this year compared to only four last year), the peppers seem more content and are still putting on flowers. And lastly – to revisit how the REAL grape juice wine is coming along. 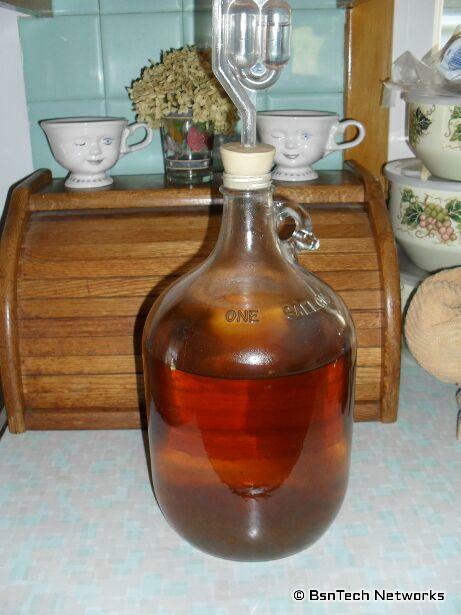 This week I moved the wine into another gallon glass jug so I could get all of the sediment removed from the wine. Looks much cleaner now with nothing on the bottom! Of course though, you can see it is maybe 3/4 a gallon of wine after it was all removed. Unfortunately this leaves the wine open to a lot of oxygen in the top of the bottle – even though I have the airlock on it. When moving the wine to the second container, I was not impressed with the smell of it. Smelled pretty bad I thought. I took a sip of the wine and it tasted just like it smelled. While it is hard for me to relay the flavor, it seems very watery – and just doesn’t taste very good. It even has a bit of a vinegar-like flavor to it – which usually means that other bacteria took over and caused that. The whole issue I believe is that I messed up with making the wine to begin with. The grapes used were not wine grapes. Wine grapes have a lot more sugar in them than regular table grapes – which is what was used. 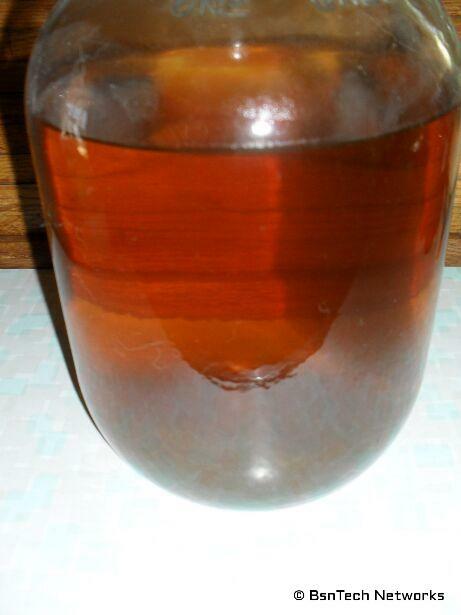 I did not add any sugar to the wine when I began fermentation – for the fact I wanted it to be “pure” real grape juice wine. Well because of that, there isn’t much of any alcohol content to it (again, I messed up since I didn’t check the specific gravity with a hydrometer to begin with to check the potential alcohol). So I’m not too sure what to do with the “wine”. There are a number of factors that are different with this real grape juice wine versus the fruit concentrate I buy at the store. This also is a white wine and not a red wine – which is what we have made in the past – so there may be issues with the amount of tannin in the wine and there also may be an issue with the pH – or the acidity of the wine. Well it is getting near the end of the year around the garden – so I’m not too sure how many other posts there will be this year. Most likely will be one more at the minimum after I’ve pulled everything out of the ground.